Despite some outstanding individual performances in 2009, for me there is pretty clear choice for the (Chessexpress) 2009 Australian Player of the Year. GM David Smerdon started the year both as an IM, and as the winner of the 2009 Queenstown Classic. He then moved his rating over the 2500 mark at the NSW Open, to confirm his GM title. A win in the Oceania Zonal booked a trip to snowy Siberia where he held GM Leinier Dominguez at bay in 2 classical time control games and then 3 rapidplay games before one bad move sent him home again. And as the icing on the cake, he was also the winner of the 2009 Yulgilbar - Think Big Grand Prix Series. Congratulations David, and I look forward to next year being just as successful. As I've stated before, I prefer to read the solution to a chess problem than actually solve it. I admire the cleverness of the problem setter in terms of how the solution looks, rather than how hard it is. And solutions that have a particular 'twist' to them appeal to me the most. An example is the solution to the diagrammed position. It is a mate in 3, and the main line has an appealing 'shape' to it. To help you discover this shape, I'll give you a solution that doesn't work. The obvious 1.Qb1 (threatening Qb8#) fails to 1. ... Bg3, covering the target square. So you need to find another plan. What are the odds that the best chess player in the world has never played chess? This thought has occured to me over the years, especially after my trip to the Solomon Islands earlier this year. The basic thrust of the article is that societal factors influence both discovery and progress in a particular field. "Where are all the great Norwegian Australian Rules footballers?" is another way of thinking about it. Now chess is a lot more universal than 'niche' sports, and it is easier to at least know what it is. But even so, there are still barriers that exist to impede progress to a higher level of play. Top of my list of things needed to progress would be access to organised competition, even ahead of access to coaching or books. Certainly this is the lesson I took away from the Solomon Islands, where a years worth of organised chess (individual and teams events), has taken local chess past countries like Papua New Guinea, where hardly any organised chess exists. The match between Boris Spassky and Viktor Korchnoi ended all square after 8 games. The second half of the match saw 2 wins for Spassky and 1 for Korchnoi, but the final game ended in a draw after only 11 moves. No surprise really, although it is a result that is more indicative of an older generation. Overall this is a better result for Spassky than Korchnoi, as Spassky hadn't played a FIDE rated game in 7 years. I'm assuming that this doesn't signal a comeback from the former World Champion but if the 'chess nostalgia' circuit takes off, he could make a little cash via that route. Since the start of December I have been bombarded with press releases from the "World Championship" tournaments being held in Las Vegas by the World Chess Federation. Some of them are totally laughable, with my favourite being "FIDE take notice of World Chess Federation". The notice was in the form of a warning not to deal with this organisation. The other press releases fall under heading of "totally pointless". They breathlessly announce that player X has beaten player Y, and now leads tournament Z. What they miss is all the other essential information that a press release needs, such as how many players are in the event, and how the other leading players might be performing. This information (including tournament crosstables) seem to be well hidden, both in the press release, and on the web page of the organisers. I suspect that this type of PR will continue until there is a sudden announcement that some 2100 player is the new "World Champion", followed by a complaint a few days later from the "World Champion" that they have had trouble cashing their winners cheque. There are a number of traditional post-Christmas chess events, with the Hastings Chess Congress probably the most famous. For many years the top event was a strong round-robin, with a mixed field of top UK players and overseas masters, but these days it has fallen victim to economic necessity, and has become large swiss, like so many other events on the chess calendar. Nonetheless it has attracted a strong lineup of players, with details to be found here. I was particularly pleased to see a preview of the tournament by Stewart Reuben, as he had been suffering from poor health a few months ago. Hopefully he is fully healed and back to his organising best. Here is an interesting chess problem for Christsmas Day (and most of Boxing Day as well). It was composed by Rinck, and I came across it in "The Complete Book of Chess" by Horowitz and Rothenberg. At first I thought it was cute due to a stalemate motif, but as I was setting the diagram in Chessbase, Fritz showed me another interesting line, if Black refuses to 'play along'. My source was silent about the slightly longer line, which is a little surprising. 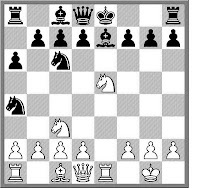 For anyone involved in chess coaching it would also serve as a useful exercise in trying to deal with all attempts at counterplay. In my family, Christmas Day tends to follow the same pattern. Early rising to open presents, then a big Christmas lunch, and then an afternoon spent wondering why there isn't any decent sport on TV. Now the lack of sport on Christmas Day wasn't always so. For example Australia got rolled by the West Indies back in 1951, with the final days play being the 25th of December. Of course having to play on Christmas Day may be an inconvenience to some, but to others it is just another day (at least culturally and religiously). Last year the Asian Clubs Championship was run over the Christmas period, which probably inconvenienced some teams. However it still got a good turn out, and there was even a round held on the 25th. Here is a game played on that day, resulting in a crisp win to Indian player Deep Sengupta. or 2 gift suggestions for Christmas. If you are looking for a last minute gift for a chessplayer, and which to avoid the obvious novelty drinking chess set etc, then I have 2 possible suggestions. "The Yiddish Policeman's Union" by Michael Chabon might be described as intellectual 'police procedural' but as the plot revolves around the murder of a man who carried the alias 'Emanuel Lasker' it has enough chess content to qualify as a 'chess' gift. And in the main the chess content is done well enough, with a few real life and historical players getting a mention. The other gift is the box set of one of the best television series ever produced, 'The Prisoner'. I gave it a wrap last year, and if you didn't get it then, you can always get it now. Not only is there an episode called 'Checkmate', but chess as a motif runs through the series. Worth getting, both for the chess, and everything in it as well. Earlier this year I had a post about Google providing on line archives to newspapers such as The Sydney Morning Herald and The Age. Paul Dunn recently informed me that the National Library of Australia already performs this service. They have digitised issues from 1803 through to 1954. The direct link to this service is here and at least when I clicked on it, the featured article was a chess column in the SMH from 22 December 1906. I assume that the featured newspaper changes each day so you may not be as lucky as I was. If not, just type "chess" into the search box and wade your way through the 38000+ links that come up! As it turns out the second variation is actually stronger than the first, although Znosko-Borovsky missed a brilliant sting in the tail. After Rxe1+ he simply states that Black wins the exchange at the price of the menace to the d pawn. However, if after 5.Kf2 Black finds 5. ... Rh1!! then he wins the other rook as well! I wonder if part of the reason why Znosko-Borovsky didn't look too deeply at the second continuation was that he simply decided that if Capablanca played it, then it must be best. I was surprised to see that Korchnoi and Spassky have jumped on the 'golden oldies' bandwagon, and are currently playing a match in Elista. The surprise mainly comes from the fact that Spassky is pretty inactive these days, although he still has a rating of 2548. Korchnoi is much more active, and just finished giving a couple of simuls at the London Chess Classic. This may account for Korchnoi's win in the first game, although Spassky did draw the second. Junta Ikeda has continued his recent run of successes with a win in the 2009 ACT Rapidplay Championship. The 42 player field attracted a number of strong Canberra players including GM David Smerdon, FM Endre Ambrus, Yi Yuan, Andrew Brown, Tuan Le and Junta Ikeda. The key game was the Round 6 clash between Ikeda and Smerdon. Smerdon had scored 5/5 up until this point, and Junta was half a point behind. In an exciting game, both players tried to take advantage of the exposed nature of the others king, but it was Ikeda who finally triumphed, with his Queen and Rooks doing the damage. A neat last round win over Andrew Brown left him on 6.5/7, just in front of Smerdon on 6. The event was held outdoors and the large field enjoyed beautiful weather throughout. The event organisers, the ACT Chess Association plan to hold it on the Saturday before Christmas in future years, and were particularly pleased with the size of the entry. This month's miniature is a surprisingly quick loss by Hikaru Nakamura. 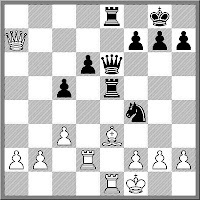 It could almost be classified as an opening trap, although one that Blacks creates for himself with a poor 9th move. The ACT Rapidplay Championship will be held this Saturday in Canberra City. The ACT Chess Association has decided to schedule this event on the last Saturday before Christmas each year, with the intention that it becomes a regular, end-of-season, event on the Canberra chess calendar. Prizes: $100 first prize minimum, other prizes dependent upon entries. This event is open to all members of the ACT Chess Association and ACT Junior Chess League. The Australian Junior Elite Training Squad (formerly the Ergas Squad) has a new sponsor. The new sponsor is Johns-Putra Limited, headed by Geraldine Johns-Putra, an active tournament player in the 1990's. These days she runs a succesful London legal consulting practice "focussing on cross-border China mergers and acquisitions. Its mission is to help clients build bridges between China and the West and to secure success across cultures." Johns-Putra Limited will fund the 2010 JETS Program, including a coaching camp in Sydney in July. The JETS squad, founded in 2000, features 30 of the best junior players from around Australia, with an emphasis on developing the skills of young talents of 14 years or less. Looks like experience triumphed over enthusiasm, with Boris Gelfand winning the FIDE World Cup with a 3-1 win over Ruslan Ponomariov in the blitz tie-breaks. After the main match was drawn 2-2, the players first played 4 games of rapidplay (1 win each and 2 draws) before moving onto the blitz. Gelfand won the first game, Ponomariov the second. After Gelfand won the 3rd game, Ponomariov needed to win the 4th to keep the match alive but as the following game shows, Gelfand scored the third and decisive victory. Via Paul Dunn comes news of a chess tournament for staff at the High Court of Australia. It was the first time such an event was held, and the arbiter for the final was the Chief Justice of the High Court, Chief Justice Robert French. be inscribed on the Chief Justice's perpetual chess trophy." more than a decade ago now, and I haven't seen a chess clock since!" Back in early 1983 I was a spectator at the Australian Open being held in Sydney. On one of the evenings after the days play was finished there was a lecture given by various members of the 1982 Olympiad team. I was only 16 years old at the time, but as I was just getting into chess I sat through the whole lecture, willing to brave the dangers of late night Sydney public transport to get home. (I actually shared the bus ride to Central Station with Stephen Solomon, but at the time I had no idea who he was and assumed he was just some random, but large, chessplayer). 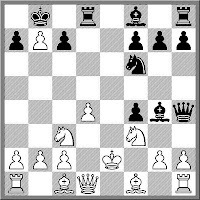 One of the games shown in the lecture Ian Roger's win over Alon Greenfeld. 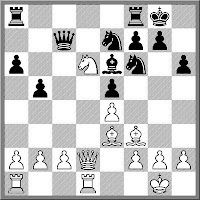 At the time Ian was experimenting with 1.c3 (the Saragossa Opening) and as the lecturer was quite proud of his win. One of the key points came on move 7, where after a number of preparatory moves, Ian triumphantly declared "Now I can play e4". At this point his co-lecturer, Darryl Johansen, pointed out that if it was so important, then surely move 1 would have been the time to do so. As someone who never understood the position nuances of opening play, most of my opening theory has been aimed towards forcing lines where I get some sort of material gain/mating attack. I am quite partial to lines involving gambits and sacrifices but again this is geared towards mating attacks (eg the Traxler, Muzio or BDM). However I am impressed by early sacrifices which don't lead directly to mate, but the slightly more subtle 'initiative'. Probably the most obvious (and unsound) example of this is the Halloween Gambit (1.e4 e5 2.Nf3 Nc6 3.Nc3 Nf6 4.Nxe5??!) where White does get to push the Black knights around for a while. While arbiting Street Chess today I saw a game involving similar ideas, but in this case it was entirely sound. 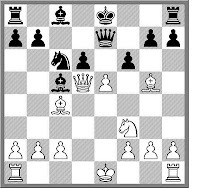 White decided to offer a piece for threats on the e file, and black decided to return the piece as a way of dealing with them. Unfortunately this allowed White to set up a mating threat which surprisingly Black missed. Australian chess Archivist Paul Dunn is currently undertaking a project to convert old issues of The CCLA Record (the predecessor to Australian Correspondence Chess Quarterly) to an electronic format, so old issues can be stored and distributed easily. The first issues of the magazine (from 1948/49) were quite slim at only 8 pages. I am not sure who the editor was, but I suspect is was Max Salm, as he was both the CCLA Publicity Officer at the time, and annotated the games in the magazine. If he was it is fitting that the first game published was a win of his, which I present here, complete with his annotations. In Correspondence Chess, access to books and databases is pretty important. Certainly in almost every CC game I play, I will utilise both Chessbase and whatever opening books I have in my library, to improve my chances of winning. Sometimes this means that the game you play may only involve a few moves of original thought before getting a decisive advantage, or, as in the case of the following game, no original thought at all. 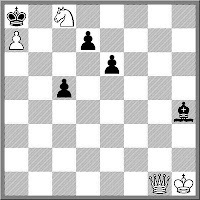 The whole game, up until move 16, had been played back in 1980, with J. Franklin Campbell defeating Lee Jerger. The final of the 2009 FIDE World CUP KO will be played between Boris Gelfand and Ruslan Ponomariov. Gelfand qualified with easy, beating Karjakin 2-0 in regulation time, while Ponomariov went into overtime against Malakhov before winning 4-2 (3-1 in the playoffs). Here is Gelfand's crushing win in the second game. 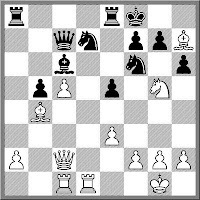 Trawling through my old archives I came across an interesting game from the 2002 Olympiad. It was played on the lower boards, and while it wasn't flawless chess, it did contain one interesting feature. From move 16 to move 20 White marches his pawn from a2 to a8, whereupon it promotes (of course). The strongest tournament to be played in London in 25 years kicks of tomorrow. The London Chess Classic has the top 4 English players (Short, Adams, McShane and Howell) and 4 Super GM's (Carlsen, Kramnik, Nakamura and Hua) playing an 8 player RR. Alongside it will be a number of side events as well. Today is the drawing of lots, with the first round starting at 1400 GMT (1 am Canberra time) tomorrow. The 2009 Australian Schools Teams Championship (not to be confused with the National Schools Championship) finished earlier today in Melbourne. Interestingly the 2 open sections (Secondary and Primary Schools) were won by Victorian teams, while the 2 girls sections were won by Queensland teams. Scotch College was the winner of the Open Secondary section, with Mount View the winner of the Primary. Somerset College finished first in the Girls Secondary, with Sommerville House winning the Girls Primary. In the Girls Primary, ACT representatives Curtin Primary finished second, while Radford College placed third in the Girls Section. In the Open Primary Kaleen tied for 4th while Radford finished 5th in the Open Secondary. Over at Chessvibes there is an article concerning chess and rock music. One of the songs highlighted is "Bad losers on Yahoo Chess" by Half Man Half Biscuit (who also authored the classic "We built this village on a Trad. Arr. Tune.") They also discuss a couple of other songs and video clips that reference chess, but they miss one very obvious entry. The New Zealand/Australian band Dragon once released a song called "The Dreaded Maroczy Bind". When I was first told this I found such a song title so unbelievable that I bet $20 that it was just a wind up. I was $20 poorer when I was shown a copy of "Dragon's Greatest Hits" with said song on it. The explanation for the song and the title was that their songwriter Paul Hewson was not just a musician, but also a serious chess player. One of their big hits "April Sun in Cuba" was more subtly chess themed, being inspired by Capablanca, although he doesn't get a mention in the song. One of the greatest games ever played (IMHO) was the clash between Steel and Amateur, Calcutta 1886. 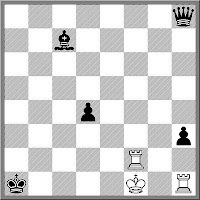 In the game White sacrifices his queen, and then 2 rooks, all the while marching his king up to a6 the effect a brilliant (if avoidable) mate. 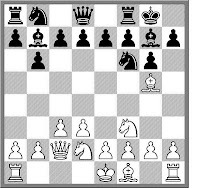 Part of the charm of the game was that White chose an opening that exposed his king to attack. These days such games are a rarity, but not completely unknown. 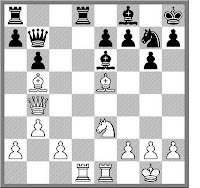 Just last month 2 strong US players chose to repeat the exact opening of the Steel v Amateur game, at least up until move 8. However Black tried a different line, and while I'm not sure whether White appreciated the significance of the change, Black quickly reached a winning position. Chess Pie is apparently a staple desert pie from the southern states of the USA. I've never tried it (and now cannot, for medical reasons) but it sounds deadly (sugar, brown sugar and corn flour/syrup are just some of the ingredients). It's name apparently has nothing to do with the game of chess, and may be a corruption of 'jest (just) a pie' as in "What are you eating?" "Jest pie". If you want to give it a go (for Christmas desert) you can find a recipe, and some history, here. The national Interschools Final (not to be confused with a National Interschools Final or even the Australian Schools Teams Championship) was held in Melbourne on the 30th November&1st December. The Australian Capital Territory was represented by a few schools, and all of them did well. In the Primary section Kaleen Primary finished 7th and Curtin Primary 10th, out of a field of 24 teams. Jamie-Lee Guo (Kaleen Primary) picked up bronze medal for scoring 6/7 (and edging out Michael Kethro from Curtin on countback). In the Middle High School section (years 7-9) Alfred Deakin High finished third in a small field of 7 teams. Angus Gruen scored a bronze with 5.5/7. In the Open High School section Alfred Deakin High did one better, finishing second in a 13 team field. This was particularly meritorious as the Government Education system in the ACT runs a High School/College model, where High Schools only go to year 10. Joshua Bishop completed the hat-trick of bronze medals, scoring 6/7 for a third place finish. The winner of the Open Secondary was Aukland Grammar (from New Zealand obviously), while another NZ School, Sommerville, finished second in the Middle High School section. Final standings can be found at the home page of the event organisers, Chesskids. Is 1.... f6 the ugliest reply to 1.e4? Possibly, although maybe 1. ... f5 deserves that title. I'm not even sure 1. e4 f6 has a name, although I know that 1.e4 f5 2.exf5 Kf7! does (The Tumbleweed if you are interested). However while 1. ... f6 may be ugly, I have at least one game where it claims a high profile victim. Thomas Barnes used it against Paul Morphy back in 1858, and pulled off a victory. In fact the unheralded Barnes seemed to have quite a good record against Morphy (at least compared to everyone else), so may be it was the offbeat that put him off his game.